Converting to drip irrigation can deliver significant long-term production and economic benefits. 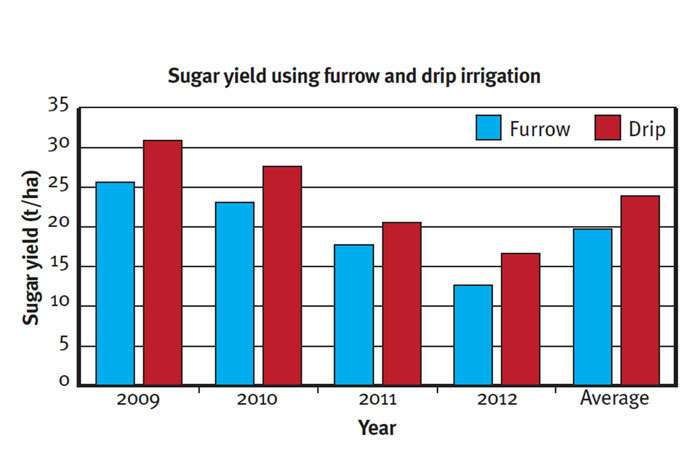 Sugarcane yields and gross returns are higher with drip irrigation than with furrow irrigation. Improved irrigation practices in sugarcane can increase cane and sugar yields and reduce the loss of water and nitrogen from runoff and deep drainage. All sugarcane grown in the Burdekin is irrigated. Most farms are irrigated by flooding the furrows between the rows of cane, which is labour and water intensive but relatively cheap to establish. Drip irrigation comprises rows of plastic tube buried underground that deliver water directly to the roots of the plant through tiny emitters that regulate water flow. It uses far less water, increases yield and improves the quality of water that runs off farms. This paddock trial, located in Ayr, tested the production and profitability benefits of converting from furrow to drip irrigation. The trial was on paddocks producing lower than expected yields due to poor irrigation uniformity and excessive deep drainage. It started in 2008 and covers an area of 6.7 hectares. Most of the block was furrow irrigated, however drip irrigation was installed on a small area because the shape and form of the block was not suited to furrow irrigation and caused uneven watering. The cost of laser levelling the fields was comparable to installing drip irrigation. The site comprises sandy soil, where losses to deep drainage below the root zone require careful management. Sugar yields increased from 25.7 tonnes per hectare under furrow irrigation to 31.0 tonnes per hectare under drip irrigation. The plant crop was harvested in July 2009 after around 2000 millimetres of rain fell. A similar yield benefit occurred in each of the three ratoon crops. On average, the drip irrigation has produced an extra 4.2 tonnes of sugar per hectare at each harvest. Almost 17 tonnes per hectare of extra sugar was produced by the drip irrigation over the four harvests. Drip tube costs up to $3500 per hectare with additional costs for pumps, filters and computerised timers. The higher yields have made quite a difference to the gross returns and the operator believes that if the results of the trial continue, the drip tube will be paid for in less than three years. 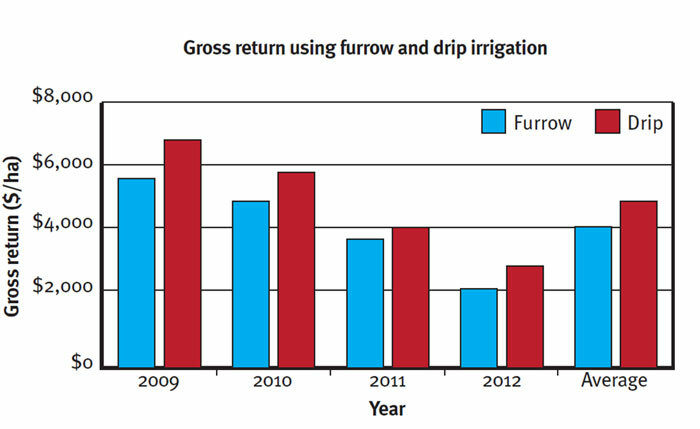 Drip irrigation has allowed the operator to considerably reduce total water use. Monitoring and modelling shows this will reduce water and nitrogen losses to deep drainage on these sandy soils. In addition to reducing run-off, drip irrigation helps place water more accurately in the root zone where the plant needs it, reducing deep drainage losses which can lead to rising water tables. The use of drip irrigation has allowed the operator to reduce total irrigation water use by approximately 50 per cent. 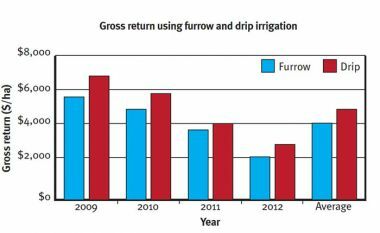 Also, while the yields under drip irrigation have increased, nitrogen fertiliser use has remained similar. Improving nutrient and irrigation practice with drip irrigation reduces the amount of excess irrigation water and nutrients applied to the crop and results in less nitrogen lost to the environment. The operator is continuing to collect additional information on crop yield, water, nutrient and other input costs to confirm the longer-term economic benefits of converting to drip irrigation. Meanwhile, the Paddock to Reef program will continue to measure and gather more information on the deep drainage water and nutrient losses on sandy soils under drip and furrow irrigation. Steve Attard (CSIRO) and Dianna O'Donnell (NQ Dry Tropics).